We use Dawn Wing couriers for small items and Time Freight for larger shipments. We are able to ship anywhere throughout South Africa. Unfortunately we are not able to offer international shipments at this stage. We are able to send shipments to the international forwarder of the customers choice to arrange themselves but will not be able to arrange the international shipment at this time. Shipping times vary due to a range of factors which are often beyond our control but should take on average between 4 and 7 days working days to reach the customer. For tracking details, please contact our logistics partner on our contacts page. Our delivery partners will deliver your order in four to seven working days at a flat rate of R450.00 ex VAT for large items, R200 ex VAT for medium-size items and R70 ex VAT for small items in the Western Cape regions, and a flat rate of R650.00 for large items, R300 ex VAT for medium-size items and R95 ex VAT for small items for the rest of South Africa. If you purchase a basket of products, you will only be charged for the freight of the largest item and not per item. This will be visible and transparent when in the checkout process. There are many ways to access the shop but the easiest is from the Shop tab at the top bar. 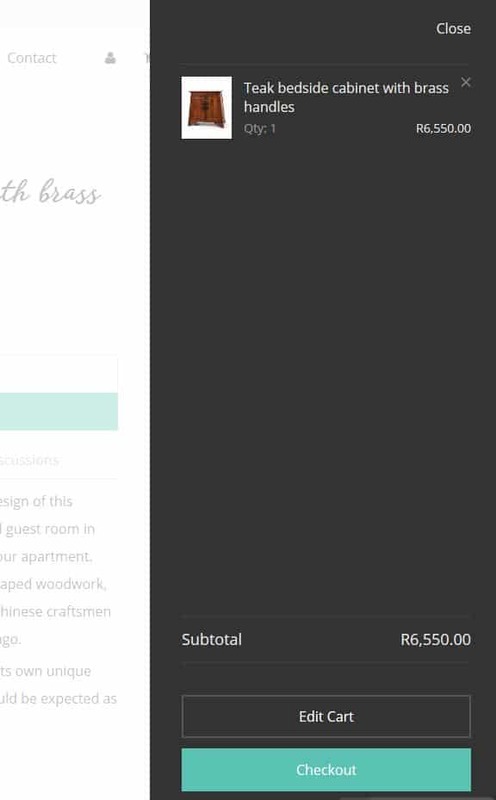 Once in the shop page, you will be able to shop more efficiently by clicking on the category hyperlink just below the top bar. This will help you navigate between the various products you would like to view. 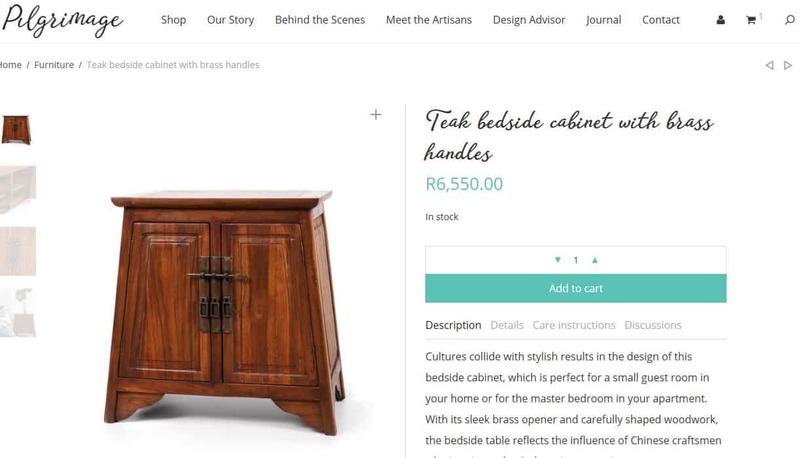 Once you have selected the product you would like to purchase, make sure that you click on the actual product picture to open up that product. Once the product page has been opened you will see the option to select Quantity from the dropdown list. For some products there are variations which we think the customer would like to choose for themselves. Therefore the customer will be able to go to the Product Variation tab and go through each variation number to see the corresponding product picture will appear as an image on the left with each different variation selected. Select the preferred variation and quantity. After selecting Add to cart, you will see the shopping car appear on the right of the screen. This shopping cart will keep you up to date with your purchase thus far. If you would like to continue shopping, just click anywhere on the screen other than the shopping cart and you can go back to your shopping process. During the shop, you may want to shop for a few items. That is not an issue and once you have selected another product and clicked Add to cart, you will see the shopping cart again appear on the right, except this time with all you products in the cart. 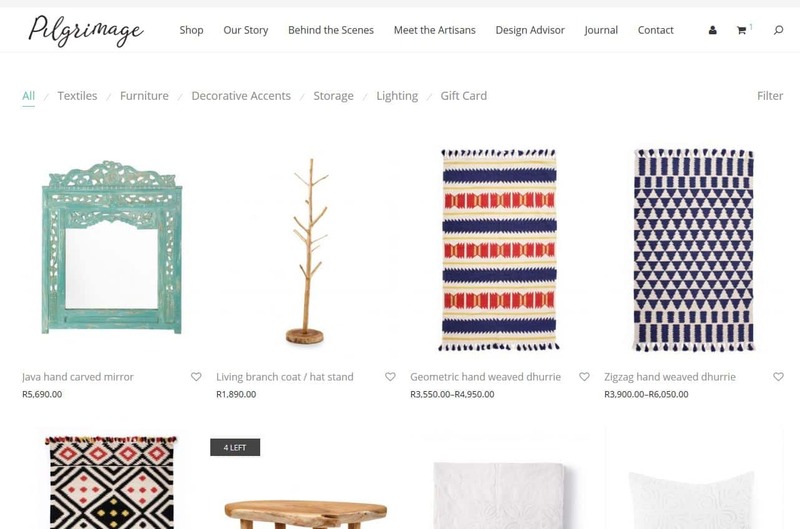 You can access the shopping cart either after adding a product to the cart or at any time by clicking on the shopping cart icon at the top right of the page. 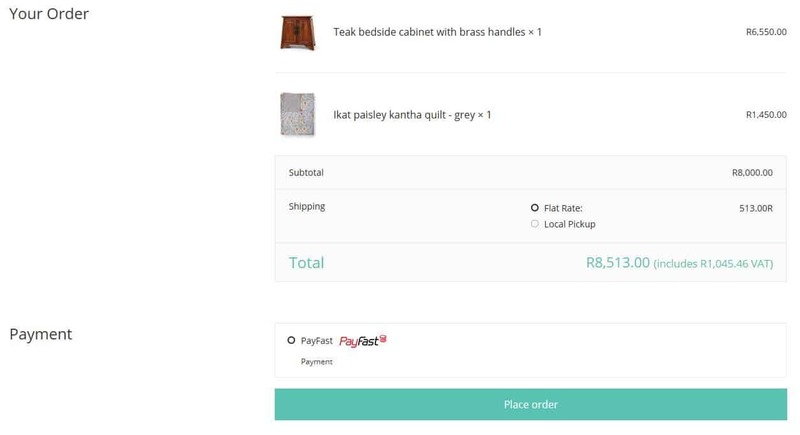 From the shopping cart, you can move to checkout by clicking the Checkout button. This will take you to the checkout screen. Click on Enter your code and you will see a field appear where the code can be entered. Click Apply Coupon. You will then be able to put in all your details such as shipping address, email address, etc. Please don’t forget to select province and area code or else the checkout system won’t be able to calculate the shipping options available to you. Customers in the Western Cape can select Local pickup but customers in the rest of SA will not have that option. There are 3 payment options during checkout, Credit card, Debit card and instant EFT. By selecting either credit card or debit card, you will get taken to the Payfast gateway where you will be required to enter your details in order to complete the transaction. Please note that all your details will be completely safe and will only be available Payfast (a registered secure payment gateway provider). Should you wish to pay by Instant EFT, please select that option during the checkout payment process. The process works the same as regular EFT although the payment is instant which will allow immediate delivery as opposed to EFT by other methods, which may take 2 working days to reflect. Should you have any queries during or after your shop, please don’t hesitate to contact us by email or phone. Details are available on the contact page. We use Payfast to manage our payment gateway and therefore will accept Visa, MasterCard and instant EFT. We unfortunately will only accept payment online at the time of purchase and do not accept cash or cheque. Yes it is. In fact, online shipping is growing exponentially with more and more people enjoying the benefit of shopping from anywhere in the world. You should however be caution with leaving your credit card details in sight in public places and avoid using internet cafes for online payments. If you placed an order and realized that there is an error in your order quantity or product type, please contact us be email as soon as possible. If the product has not been processed yet, we will be able to cancel the order and refund your money. If the order has already been or being shipped we can still cancel the order and refund your money but unfortunately will still need to charge you for the logistics cost and return costs. In the shopping section of the store, select the product and quantity and click “Add to cart”. Please note that certain product have variable qualities and each one is shown on the dropdown menu to ensure that the customer gets exactly what they buy. Once you have finished selecting the products you would like to purchase, select “Checkout” and then follow the simple checkout and payment process to finalise the sale. No you don’t need an account to place an order although we would recommend you sign up with us to ensure that you are kept informed of new products and specials. If you would like to return a product due to damage or another legitimate reason, please mail us at logistics@pilgrimagespaces.co.za and follow the procedure in our Shipping and Returns section on this site. How do I know that these products are geniune and authentic? The owners of Pilgrimage Livingspaces have personally been to most of the manufacturing and sourcing sites to ensure that the products are genuine and authentic. The manufacture of many of the products have been filmed and recorded. 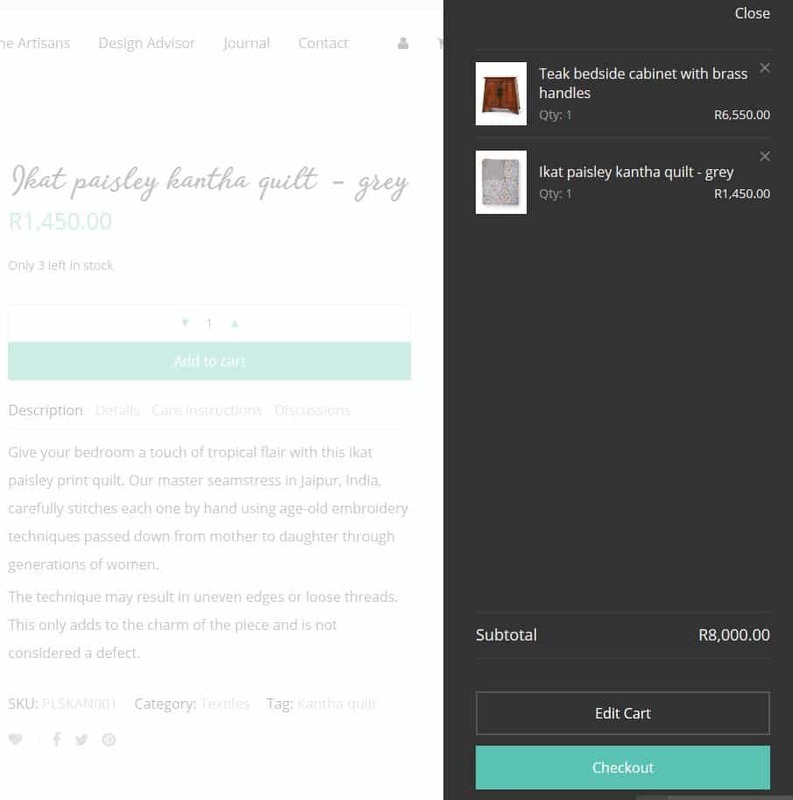 We do not purchase from any bulk manufacturers and go directly to the artisans that manufacture the products using their traditional techniques. How do I know that the indigo dye in genuine and not printed using chemical dye? If you take two pieces of indigo fabric and rub them briskly together, when pressing your nose the fabric will be able to smell a very distinct earthy vegetable smell. This is the smell of the indigo plant.